The pig-tailed snub-nosed monkey weighs about 7 kg (15 lb). It lives in primary forest, where it is primarily arboreal, only descending to the ground when disturbed. Its diet consists mostly of leaves and some fruit and berries. Most observed social groups are small (3-8 monkeys). These may be harem groups with more than 1 adult female or a monogamous group consisting of an adult pair and its young. 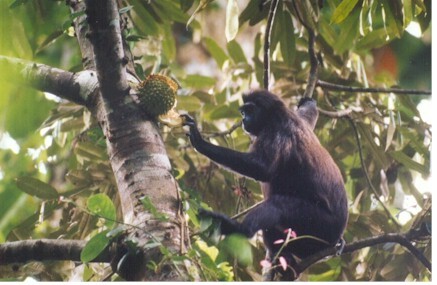 Groups containing about 20 individuals have been observed in primary forest. Home ranges of 3.5 - 20 hectares (8.8 - 50 acres) have been observed. (Davies & Oates 1994) . The pig-tailed snub-nosed monkey has only been recorded from the Mentawai Islands, off the west coast of Sumatra, Indonesia. In 1987 it was thought to occur on Siberut, Sipora, Pagai Utara, Pagai Seletan, and a small islet near the Katurei Peninsula, Siberut. Reasons for its decline include hunting for food and habitat loss, mainly due to logging. *** In 1974 the pig-tailed snub-nosed monkey was considered one of the 25 most endangered mammals in the world (Fitter 1974) . 2004: Occurs in Indonesia (IUCN 2004). As of 1968 the pig-tailed snub-nosed monkey had been recorded only from the islands of South Pagi, Sipora and Siberut in the Mentawai Islands group, off the west coast of Sumatra, Indonesia. In 1987 it was thought to occur in the Mentawai Islands on Siberut, Sipora, Pagai Utara, Pagai Seletan, and a small islet near the Katurei Peninsula, Siberut. Reasons for decline of the pig-tailed snub-nosed monkey include hunting for food and habitat loss, mainly due to logging. The pig-tailed snub-nosed monkey weighs about 7 kg (15 lb). It is found in primary forest. The pig-tailed snub-nosed monkey is one of the species that live in the Sundaland Biodiversity Hotspot (Cons. Intl. 2005) . Newborn young have been observed in June and July. The pig-tailed snub-nosed monkey eats mostly leaves and some fruit and berries. The pig-tailed snub-nosed monkey is primarily arboreal, only descending to the ground when disturbed. Most observed social groups are small (3-8 monkeys). These may be harem groups with more than 1 adult female or a monogamous group consisting of an adult pair and its young. Groups containing about 20 individuals have been observed in primary forest. (Davies & Oates 1994) . Home ranges of 3.5 - 20 hectares (8.8 - 50 acres) have been observed (Davies & Oates 1994) . Burton & Pearson 1987, Cons. Intl. 2005, Curry-Lindahl 1972, Davies & Oates 1994, Fitter 1974, IUCN 1968, IUCN 1994, IUCN 1996, IUCN 2000, IUCN 2003a, IUCN 2004, Macdonald 1984, Nowak & Paradiso 1983, Prim. Cons., Inc.